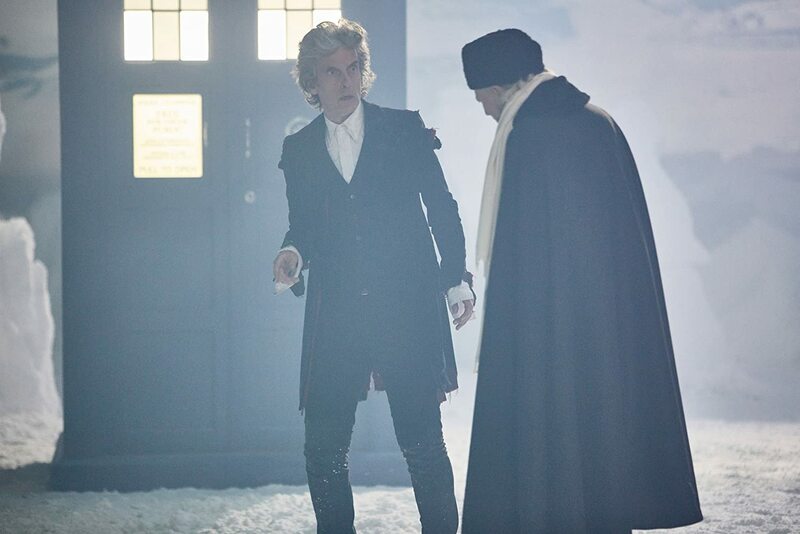 This year’s Doctor Who Christmas offering, “Twice Upon a Time” is the holiday season swan song from writer/producer Steven Moffat, as well as departing current Doctor, Peter Capaldi. It’s not quite as frantic as other Doctor Who Christmas specials; with the series’ annual holiday angle worked in less gaudily than in some previous installments. “Twice…” is a bit more relaxed, sentimental, strewn with bits of Doctor Who lore and fan service…and I enjoyed every minute of it. The story begins with two Doctors at the end of their current lives, facing regeneration. 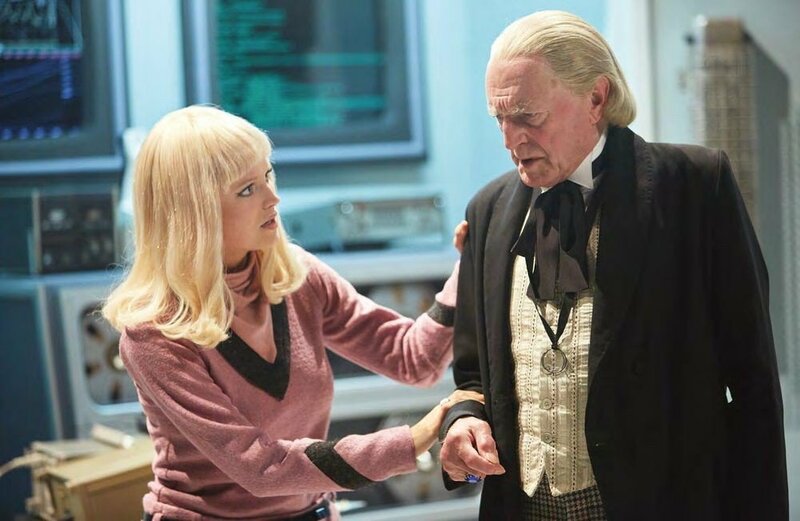 The first Doctor and the current incarnation. Black and white footage of William Hartnell’s First Doctor (from 1966’s serial, “The Tenth Planet”) is near-seamlessly blended with current First Doctor actor David Bradley taking over the role. 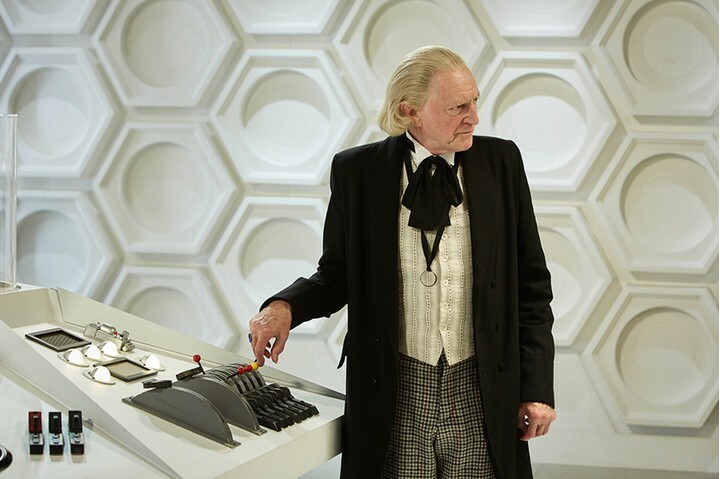 Bradley previously played Hartnell in the DW 50th anniversary making-of special “Adventure in Space and Time” (2013). 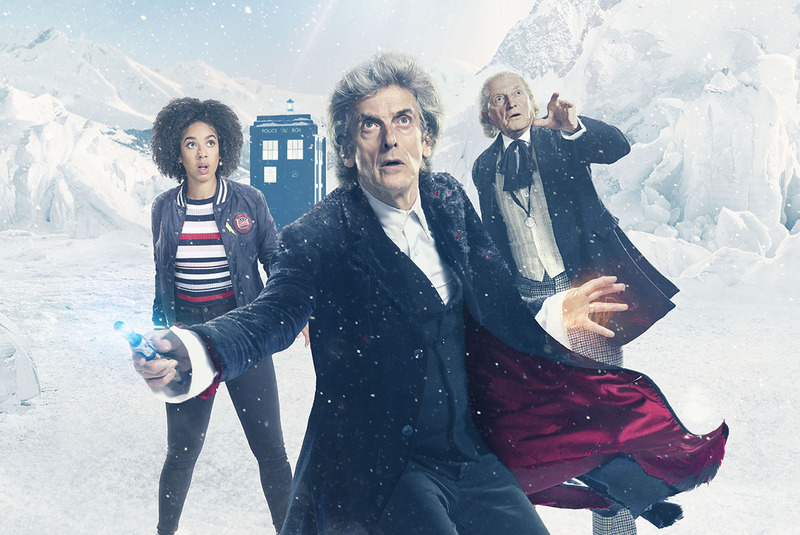 The two Doctors meet in a pocket of ‘frozen time’ at the South Pole (the suspended CG snowflakes are gorgeous), where they encounter a displaced British soldier seemingly plucked from World War 1, along with what appears to be the Doctor’s late, cyberman-assimilated companion Bill Potts (an always welcome Perl Mackie). Their Tardis is abducted by a large vessel belonging to a glass being from a presumed race (?) of beings calling themselves “Testimony.” These beings (or being?) freeze time to capture creatures at the exact moment of their deaths, and learn about them from the sum of their memories. 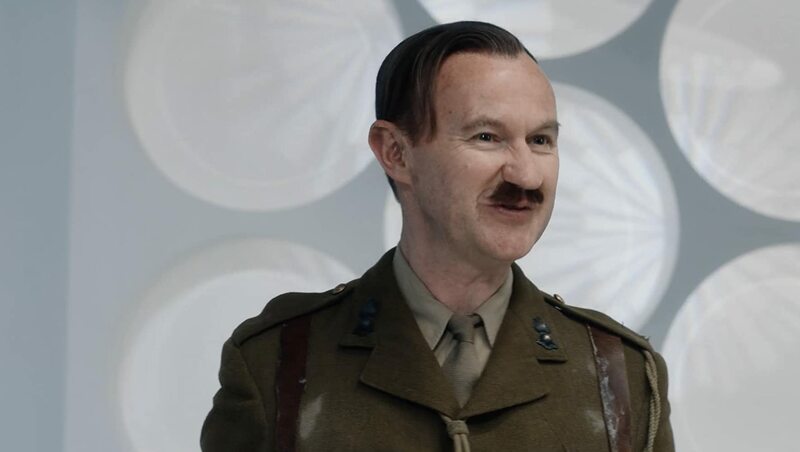 The World War 1 captain (multitalented “Doctor Who”/“Sherlock” writer/actor/producer/occasional-director Mark Gatiss) was in a face-off with a German soldier in the trenches when he was abducted, and Bill can’t seem to remember exactly how she returned…arousing the Doctor’s suspicion. Together, with the help of an angry Dalek dissident (encountered in the 2014 episode, “Inside a Dalek”), the Doctor uses a networked Dalek database to uncover the truth about the Testimony, and in a rare surprise, they are discovered to be utterly benevolent (!). 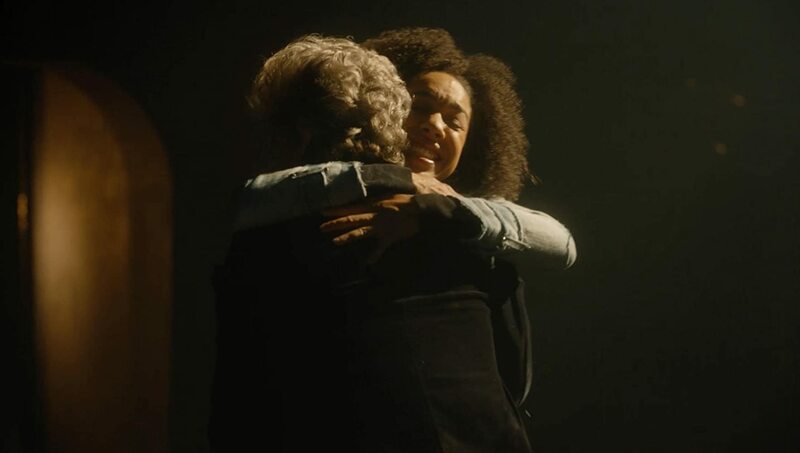 This lack of an evil adversary was a welcome respite from the Doctor as “monster killer” and “Doctor of War.” It also allows a nice insight into what makes us truly sentient…we are the sum total of our memories; ultimately they are us. The clear glass Testimony beings are literal empty vessels awaiting fulfillment from the memories of beings who are slated to die, and to offer them a chance for an avatar-immortality. Truly no downside. They are more angel than demon. I was both surprised and delighted by this particular story twist (and I sure hope the writers/producers of “Star Trek Discovery” were watching… that show needs an optimism injection, quick). 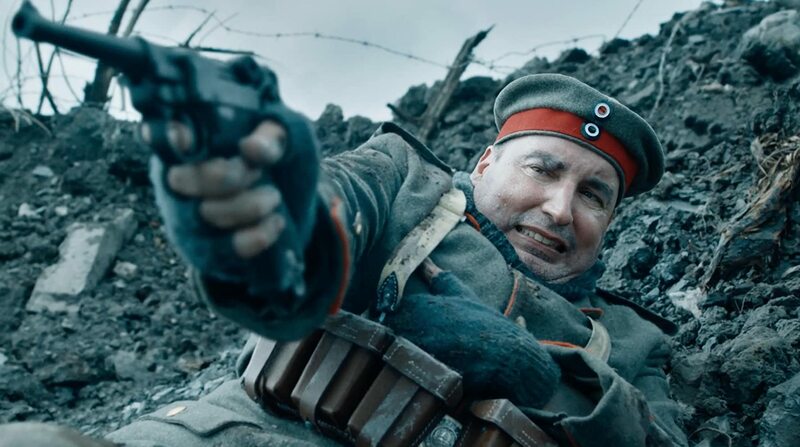 In the episode’s only direct reference to the Christmas season, the World War 1 captain is returned to the exact moment of his armed standoff with the terrified German soldier, when a true Christmas miracle happens… the unexpected and fleeting armistice of 1914; the legendary event that inspired the terrific 2006 film, “Joyeux Noel.” German and Brits take a break from the killing to sing carols and tend to each other’s wounds. Bill, now existing in glass Testamony-form as the sum total of her memories, gets a proper goodbye with her Doctor (many fans, including myself, were deeply unsatisfied with her cruel, Cyberman-assimilated death). There is also an unexpected cameo from “the girl who died” herself, Clara Oswald (once again played by Jenna Coleman). 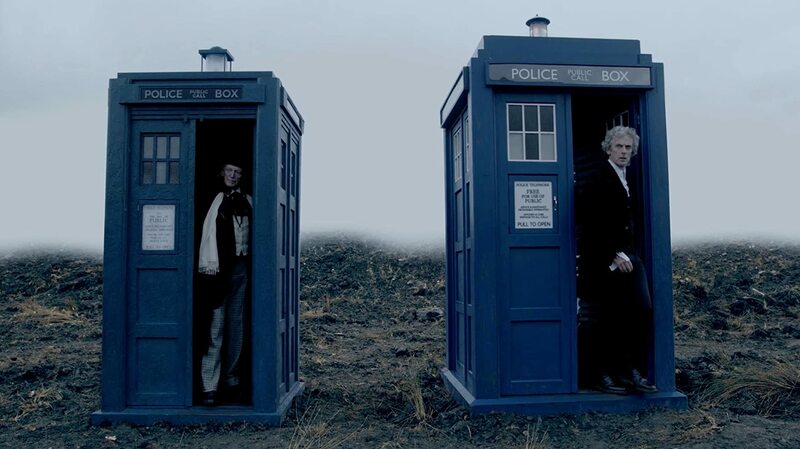 The two Doctors, now accepting their inevitable fates return to their respective times to regenerate. Doctor One, to the astonishment of his old companions Ben and Polly, regenerates into Doctor Two (the late Patrick Troughton; again using footage from “The Tenth Planet”). The current Doctor goes off alone, and finally regenerates into his/her first female form (Jodie Whittaker), as the Tardis is seemingly ripping itself apart mid-flight and spiraling out of control (much as it did when David Tennant’s Doctor regenerated into Matt Smith’s). A typically cliffhanging ending to an unabashedly sentimental, and surprisingly benevolent Doctor Who story. * A bow for the cast. * An appropriate exit for Capaldi’s Doctor. Capaldi took a bit of time for me to warm up to; he was somewhat daffy and disagreeable in his earliest episodes, but he soon grew on me. 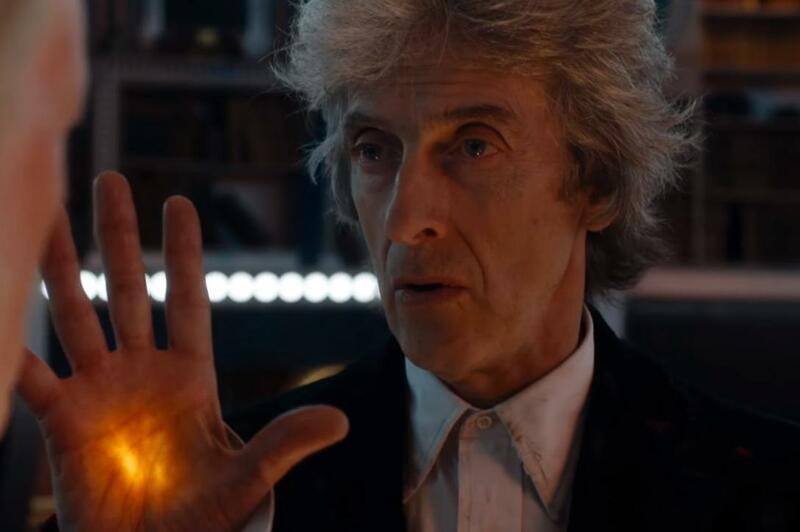 For me, his creme de la creme episodes were “The Zygon Invasion” two-parter (his passionate speech on war should be required viewing for all UN ambassadors) as well as “Oxygen,” “Pyramid at the End of the World,” “Heaven Sent,” and “Empress of Mars.” Like many Doctors, there’s always that ‘getting-to-know-you’ phase, followed by genuine liking, and then… the bittersweet departure. The shower of sentiment rained upon Peter Capaldi feels earned. * Current Doctor apologizing for the behavior of his sexist, earlier self. * Lots of cameos and fan service. A quick glimpse of 1960s-era companions Ben & Polly, Clara’s avatar self, the images/memory projections of all incarnations of the Doctor, the Daleks, the mention of the WW1 captain being an ancestor of future Doctor companion/ally Brigadier Lethbridge-Stewart, the black-and-white opening and regeneration footage from “The Tenth Planet”, etc. There is enough fan service in this special to supply an anniversary episode, but I didn’t mind a bit. Granted, this wasn’t an easily accessible episode for relative newcomers to Doctor Who, and that lack of accessibility would normally be a liability for another series, but hey…it’s Christmas. This is the BBC’s (and Steven Moffat’s) Christmas gift to the longtime fans, and I enjoyed it very much. * We finally see the emergence of Jodie Whittaker’s Doctor. As for any nits of this episode? None naggingly come to mind. The biggest surprises for me were not the cameos, name-dropping or fan service bits, but more from the story itself. This was a rare, non-monster story that featured a benevolent race offering a service to humanity (and the Doctor), not destruction. This benevolence also allowed for an unusual amount of reflection for the characters, but with enough momentum (and brevity) to keep the viewer engaged in them and their moments together. And unlike some previous DW holiday specials which are often guilty of using the colorful seasonal tropes to death, this episode used a more minimalist Christmas theme for maximum emotional impact. Writer Steven Moffat and director Rachel Talalay wisely eschew garish holiday lights, Christmas planets, illusionary Santa Clauses, sleigh rides and sentient Christmas trees; instead they offer a nice, poignant and even literal reminder that it’s supposed to be a season of peace. That’s the best gift of all. While I admire this series, I am not a fan and haven’t watched an episode in years. However I watched this episode with my brother-in-law and really liked it. It was a good starting point for new viewers and a proper send off for the twelfth Doctor. I loved his words of wisdom at the end! And here I was, worrying it might contain too much Doctor Who fan service for a casual viewer! So glad to be wrong! Thanks for that perspective, Nancy. Loved how they did the regeneration. that ring coming off the hand, Brilliant. Great stuff, I really enjoyed the fan service references, at least the ones that caught my eye. The final part of The Tenth Planet is actually lost, so we have BBC’s children’s show Blue Peter to thank for the regeneration scenes, as they did a DW special of their own, still to be found in the BBC archives. I guess I really should give the Big Finish audio dramas a go. Some of them feature David Bradley as the First Doctor, and there are also a number of episodes featuring Paul McGann as the Eight Doctor (one of my favorites). Indeed, I’ve heard the animation is pretty good. That said, they used the Blue Peter footage for TUaT.